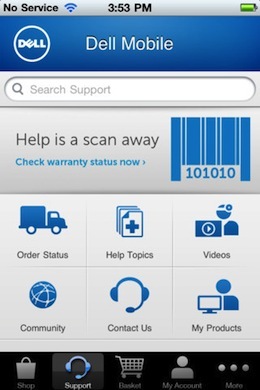 In a move that has Apple written all over it, Dell has launched a new mobile app which makes it easy its UK customers to purchase products on the go. The electronics manufacturer is bringing a sleek and easy-to-use mobile marketplace to both its both Android and iOS users in the UK, already offering an identical option to its US customer-base. The US version of the app hasn’t fared well, with an average rating of 3 stars for all version. It is worth noting however, that even Apple’s own mobile marketplace for its gadgets and products, with a strikingly similar list of features, hasn’t done much better, with an average rating of 3 and a half stars. 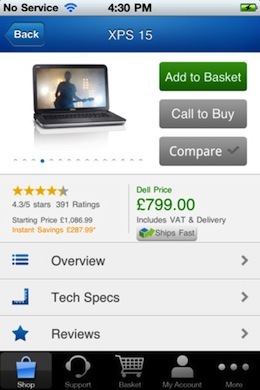 With the new app catering to a UK audience, Dell is giving its users a fast and secure way to purchase Dell products, access reviews and side-by-side comparison of products. It also offers round-the-clock support as well as a bit of a social twist, with collaborative shopping features, and scanning of products to access support and warranty information. Taking the Dell.co.uk experience from desktop browser to specifically designed mobile apps shows the company making strides to make sure they can get to their customers, no matter where they are. Speaking about the app, senior vice president of Dell.com, Ron Rose, said “People are using mobile apps like never before to browse for and purchase products”. He added, “With our new Android app, we’re extending the leading edge functionality of Dell.com into the mobile space, and making it even easier to find the right system for your needs”.